Learn how to make ceramic tile icons. In Orthodox faith traditions, icons are images of saints that comprise important elements of an Orthodox church sanctuary. 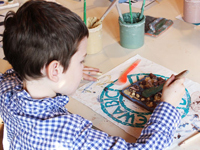 In this craft activity, an instructor from Detroit's historic Pewabic Pottery will help kids create an iconic image of their own selection (religious, cultural or pop culture) on a ceramic tile. The event is free and open to children ages 6-12. To RSVP, email Wisal Samaha at wsamaha@accesscommunity.org, or call 313-624-0219. Parental supervision is required.